On the question of Strzok's bias and whether we should believe he didn't act on it. The question every American should ask is this: How would you feel if he'd expressed such disgust toward you, and was also investigating you? FBI agent Peter Strzok’s appearance before Congress Thursday was a predictable political circus, and here’s what we learned: President Trump will have to declassify a host of documents if he wants Americans to learn the truth about what happened in 2016. 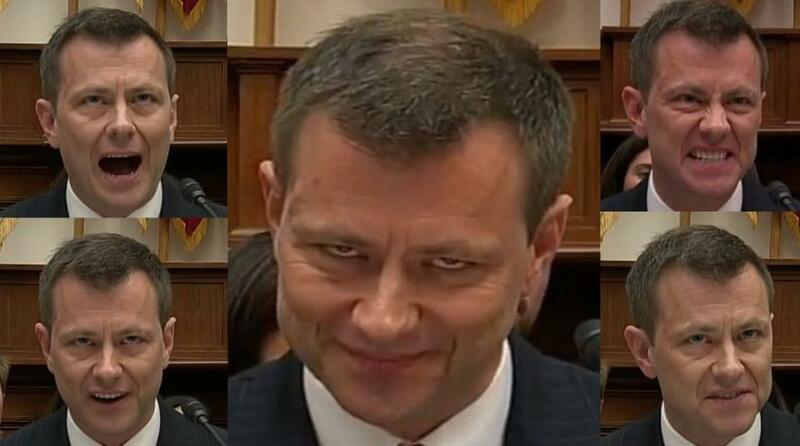 Mr. Strzok was combative, and he pointed to an FBI lawyer in the room as reason not to disclose much of anything about his investigation into the Russia connections of the Trump campaign. Under pressure from Ohio’s Jim Jordan, Mr. Strzok did reveal that Justice Department official Bruce Ohr acted as a channel between the opposition-research firm Fusion GPS and the FBI in 2016. We already knew that Mr. Ohr’s wife Nellie worked for Fusion. This means that Fusion, an outfit on the payroll of the Clinton campaign, had a messenger on the government payroll to deliver its anti-Trump documents to the FBI. This confirms that the FBI relied on politically motivated sources as part of its probe, even as Mr. Strzok insists he showed no political bias in his investigating decisions. The FISA applications. Justice and the FBI made one application and three renewals for warrants against former Trump campaign aide Carter Page. The text of those applications would show the degree to which the FBI relied on the dossier compiled by Christopher Steele at the request of Fusion GPS. They would also show how honest FBI and Justice were with the Foreign Intelligence Surveillance Court that approves warrants. Woods procedures documents. The FBI is required to vet and support the facts its presents to a FISA court when it seeks a warrant to eavesdrop on a U.S. citizen. These rules are known as Woods procedures, and releasing sections of this Woods file would show the extent to which the FBI verified the dossier or other evidence it used as its justification to listen to Trump campaign aides. More broadly, Mr. Trump should declassify any document that demonstrates what the FBI and Justice knew about the provenance and accuracy of the Fusion-Steele dossier. The 302s. These forms include information taken from the notes FBI agents make while interviewing a source or subject. Senate Judiciary Chairman Chuck Grassley last week asked Justice to declassify the 302s for 12 separate FBI interviews with Mr. Ohr concerning his contacts with Mr. Steele. Declassifying other 302s related to the subjects in this probe (including former Trump aides George Papadopoulos, Michael Flynn ) would reveal what the FBI was told, who provided what information, and how much came from politically motivated sources. The 1023s. These are the equivalent of 302s for counterintelligence, and they document FBI debriefings with informants or sources. Mr. Trump should declassify these and other documents showing interaction between the FBI and Mr. Steele, Fusion GPS founder Glenn Simpson, Fusion backer Dan Jones, informant Stefan Halper, or anyone the FBI used to keep tabs on the Trump campaign. These documents would reveal the extent and dates of the FBI investigation of the Trump campaign. Mr. Trump is undoubtedly being told that declassifying these documents would set a bad precedent, or risk accusations that he is undermining special counsel Bob Mueller’s investigation. But the worst precedent would be letting mistrust and partisan suspicion persist over how law enforcement behaved during a presidential campaign. Mr. Mueller’s probe is also moving ahead without interference, as his indictment Friday of a dozen Russian agents for hacking Democratic National Committee computers shows. But indictments of Russians who will never see a U.S. courtroom don’t tell us anywhere near the complete story. That duty falls to Congress, not to a special counsel whose job is deciding whether or not to prosecute crimes. Mr. Trump is going to be attacked no matter what he does. He should declassify these records or stop complaining about his Justice Department’s lack of cooperation.